EL SEGUNDO, CA—Satellite broadcast provider DirecTV has been inundated with new subscribers following Monday's introduction of NHL ShutOut, a special new sports entertainment package that allows customers to miss 100 percent of National Hockey League programming. For a one-time sign-up charge of $49.99 and a $7.99 monthly fee, DirecTV viewers can completely ignore games from all 30 NHL teams, not merely those matchups that are already blacked out in their area due to low ticket sales. "We've been working on this for a while now, and I think I speak for everyone in our Sports department when I say we couldn't be happier with the results," DirecTV programming director Ryan Sanford said. "Now, with NHL ShutOut, people can enjoy all 1,230 professional hockey games each year the way they were meant to be enjoyed: by not seeing them at all." 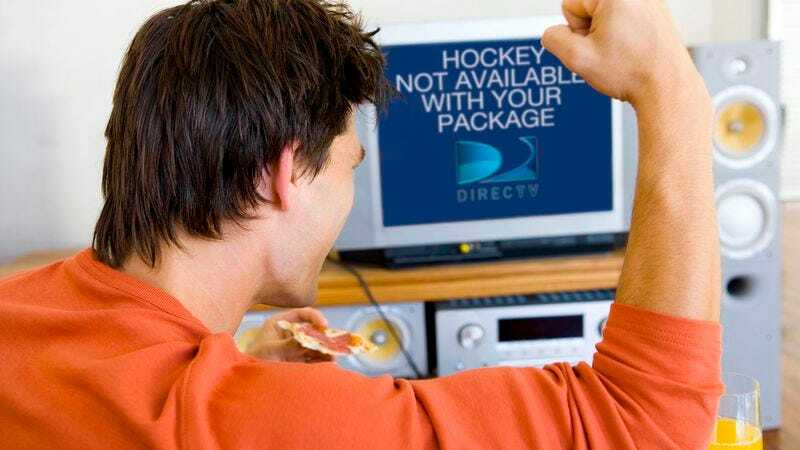 According to DirecTV, the package also denies viewers access to the NHL preseason, the playoffs, and the Stanley Cup Finals at no extra charge. For an additional fee, viewers in certain smaller, hockey-obsessed markets such as North Dakota and Boston can also opt to have college hockey removed from the programming menu. "Fifty bucks to watch a total of zero hockey games for a whole year is a complete no-brainer," said Montclair, NJ resident and new DirecTV customer Anne Walsch, who bought NHL ShutOut as an anniversary present for her husband, Bob, a Philadelphia native who grew up in Flyers country and claims he "never, ever want[s] to see even a single second of hockey" again. "I was happy to see I didn't have to pay extra to have hockey games eliminated from my premium channels as well. It's a really well-thought-out package." DirecTV began promoting NHL ShutOut as part of their overall sports programming in late September, advertising it heavily during football, basketball, and baseball games and NASCAR races in order to build excitement for the service before the hockey season began in early October. According to Sanford, there was initial disappointment when customers heard that ShutOut would not be ready for the season opener. "We weren't trying to increase demand or anything like that," said Sanford, who noted that DirecTV customers who signed up for ShutOut received a refund for any early NHL games they had been unable to ignore. "It simply wasn't ready. Test-market viewers sometimes still caught a glimpse of hockey while changing channels, and we hadn't yet figured out a way to reliably block NHL highlights from being shown on sports news shows. But we're very happy with the way it turned out." Sanford claimed the early success of the package was due in no small part to the decision to advertise it heavily during the NHL opening weekend with a combination of television spots, sponsored segments, and on-ice advertising. "There were some fans who didn't appreciate that very much," NHL commissioner Gary Bettman said. "But it was the largest advertising buy we had. Frankly, between that and the licensing and rebroadcasting money they pay to not show our games, it's the best thing that's happened to the league in years." As of Wednesday, NHL ShutOut was DirecTV's most popular new product. Sports bars are impatiently waiting the introduction of NHL ShutOutPro, which will allow proprietors to block hockey games on up to 28 televisions at a time. A solid 68 percent of new subscribers list the ability to block out hockey as their primary reason for choosing DirecTV. The company is considering making the package the foundation of a new deluxe sports programming bundle that would give viewers the ability to block not just the NHL, but MLS and the WNBA as well. "I have Time Warner right now, and I'm always going over to my buddy Dave's place to ignore hockey," Brooklyn, NY resident Carlos Uselmann said. "Avoiding hockey makes DirecTV so much better than regular cable that it's almost ridiculous. If they let me avoid other sports on demand, I'd sign up tomorrow."